The largest source of energy from wood is the waste product from the pulp and paper industry called black liquor. Logging and processing operations generate vast amounts of biomass residues. Wood processing produces sawdust and a collection of bark, branches and leaves/needles. A paper mill, which consumes vast amount of electricity, utilizes the pulp residues to create energy for in-house usage. Forest harvesting is a major source of biomass for energy. Harvesting may occur as thinning in young stands, or cutting in older stands for timber or pulp that also yields tops and branches usable for bioenergy. Harvesting operations usually remove only 25 to 50 percent of the volume, leaving the residues available as biomass for energy. Stands damaged by insects, disease or fire are additional sources of biomass. Forest residues normally have low density and fuel values that keep transport costs high, and so it is economical to reduce the biomass density in the forest itself. Crop residues encompasses all agricultural wastes such as straw, stem, stalk, leaves, husk, shell, peel, pulp, stubble, etc. which come from cereals (rice, wheat, maize or corn, sorghum, barley, millet), cotton, groundnut, jute, legumes (tomato, bean, soy) coffee, cacao, tea, fruits (banana, mango, coco, cashew) and palm oil. Rice produces both straw and rice husks at the processing plant which can be conveniently and easily converted into energy. Significant quantities of biomass remain in the fields in the form of cob when maize is harvested which can be converted into energy. Sugar cane harvesting leads to harvest residues in the fields while processing produces fibrous bagasse, both of which are good sources of energy. Dedicated energy crops are another source of woody biomass for energy. These crops are fast-growing plants, trees or other herbaceous biomass which are harvested specifically for energy production. Rapidly-growing, pest-tolerant, site and soil-specific crops have been identified by making use of bioengineering. For example, operational yield in the northern hemisphere is 10-15 tonnes/ha annually. A typical 20 MW steam cycle power station using energy crops would require a land area of around 8,000 ha to supply energy on rotation. Herbaceous energy crops are harvested annually after taking two to three years to reach full productivity. These include grasses such as switchgrass, elephant grass, bamboo, sweet sorghum, wheatgrass etc. Short rotation woody crops are fast growing hardwood trees harvested within five to eight years after planting. These include poplar, willow, silver maple, cottonwood, green ash, black walnut, sweetgum, and sycamore. Industrial crops are grown to produce specific industrial chemicals or materials, e.g. kenaf and straws for fiber, and castor for ricinoleic acid. Agricultural crops include cornstarch and corn oil soybean oil and meal wheat starch, other vegetable oils etc. Aquatic resources such as algae, giant kelp, seaweed, and microflora also contribute to bioenergy feedstock. Such waste consists of lawn and tree trimmings, whole tree trunks, wood pallets and any other construction and demolition wastes made from lumber. 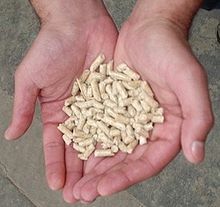 The rejected woody material can be collected after a construction or demolition project and turned into mulch, compost or used to fuel bioenergy plants.